NASA's MAVEN spacecraft, which braked into orbit around Mars last month, is sailing through its checkout and commissioning phase, scientists said Tuesday, collecting initial data that demonstrates the orbiter's ability to study the red planet's upper atmosphere with the precision required to help map out its structure and evolution. Since its arrival Sept. 21, the Mars Atmosphere and Volatile Evolution -- MAVEN -- spacecraft, the centerpiece of a $671 million mission, has monitored the impact of a huge cloud of charged particles blasted away by the sun, mapped ozone concentrations and collected the best views yet showing vast, tenuous clouds of atomic oxygen, carbon and hydrogen in the upper atmosphere and extending into space. All three elements and the simpler molecules they build -- water and carbon dioxide -- are major players in climate change and scientists hope to use MAVEN's instruments to understand how the atmosphere is leaking away today and, by extension into the past, how that might have contributed to turning a once habitable world into the cold, dry planet seen today. While MAVEN is not expected to begin routine science observations until early to mid November, after detailed tests and instrument calibration, initial observations show the spacecraft should be able to deliver the goods. Among the observations unveiled Tuesday was a composite photo showing atomic hydrogen extending more than 20,000 miles into space around Mars. "The hydrogen that we're looking at here comes from water lower down in the atmosphere," said Mike Chaffin of the University of Colorado at Boulder. "The H2O is broken apart into H and O and because the H is light, it's less bound by Mars' gravity. It can float to the top of the atmosphere and escape to space much more easily than heavier atoms." The hydrogen seen escaping from Mars today "is effectively removing water from the martian atmosphere," he said. "And it's escape processes like these that may have dominated the history of martian climate change, transforming an initially warm and wet planet to the cold and dry world that we know today." The observations MAVEN will make will help scientists determine how the martian atmosphere is changing today "so we can work backward in time and understand how the martian atmosphere has evolved over the past four billion years," Chaffin said. "We're particularly interested in understand the evolution and escape of climate-controlling gasses like water, but also like carbon dioxide. H20 and C02 don't escape to space directly. But they're atomic breakdown products, C, O and H, do." Along with demonstrating MAVEN's ability to detect atomic carbon, oxygen and hydrogen, the science team showed off a dramatic map showing ozone concentrations and data showing the impact of a coronal mass ejection that hit the planet late last month. Such CMEs can disrupt communications and power grids on Earth. On Mars, they may contribute to atmospheric loss. "On Earth, ozone destruction by refrigerator CFCs is the cause of the polar ozone hole," Justin Deighann, a member of MAVEN's remote sensing team, said in a NASA news release. "It is just as easily destroyed by the byproducts of water vapor breakdown by ultraviolet sunlight. Tracking the ozone lets us track the photochemical processes taking place in the Martian atmosphere. We'll be exploring this in more complete detail during MAVEN's primary science mission." Bruce Jakosky, MAVEN's principal investigator, said the spacecraft's instruments have been activated without any major problems and that four of seven-planned rocket firings have been carried out to adjust the spacecraft's orbit, moving it from a highly elliptical 55-hour orbit to a more circular 4.6-hour orbit. Getting the spacecraft to this point "represents a major milestone," he said. "All the instruments have been turned on and are operating very well. ... The aim of our activities right now is to get to the start of science mapping, and that will be in early to mid November, depending on whether we encounter any problems. So far, we've encountered no problems whatsoever in the commissioning." While checkout and instrument calibration are not yet complete, MAVEN will join two other NASA Mars orbiters, the European Space Agency's Mars Express satellite, an Indian orbiter and two NASA surface rovers to study a comet as it makes a close flyby of Mars this Sunday. 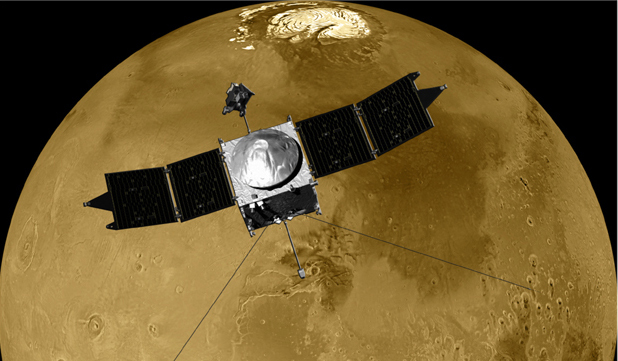 MAVEN will focus on how the comet might affect the red planet's upper atmosphere. "Because of the orbit, any dust that does hit Mars will be coming in at about 56 kilometers per second, and that will carry with it a lot of energy," Jakosky said. "We could see a significant heating. The other thing is, water is released from comets, and the water cloud is expected to be bigger than the dust cloud. So we might see an influx of water into the atmosphere." Playing it safe, MAVEN and the other orbiters will be positioned on the far side of the planet when the comet passes by.